Hiya guys! Even though I am not over my allergies and am having a hard time with my eyes nothing keeps me away from polishing! Especially when it's for a special occasion. Today is my best friend Cheyenne's (from CDBNails) birthday and to celebrate we had to do bestie twin nails again! It's become sort of tradition now to do a marble so we figured we'd throw that in with some accent art. I really love the way this turned out, it's a huge improvement over the variation we came up with last year. I have to admit the watermarble took me way longer than it probably should have. I think I did three attempts before I finally got it how I liked it. Well worth the effort though. The polishes I used for this marble were the must-have 110 Degrees and On the List by Pipe Dream Polish. My white polish of choice is always from Salon Perfect and it's called Sugar Cube. The accent nail is done completely with acrylic paint and my detail brush from Whats Up Nails. And my topcoat of choice for this design is my ever trusty Seche Vite. As you guys know, I do my watermarbles with the classic dipping in water method. I have to try out the decal method though because last night was a nightmare trying to do this. This marble was the result after three failed attempts and about two hours wasted. Now you see why I don't record my marbles, they are almost always a nightmare to try and complete. But I am definitely glad I stuck to it because the end result was totally worth it. Cheyenne is a very dear friend of mine who has been an infinite source of inspiration and support. Happy birthday my sister from another mister, may your day be full of joy and happiness. You're welcome! I hope you had a lovely birthday. 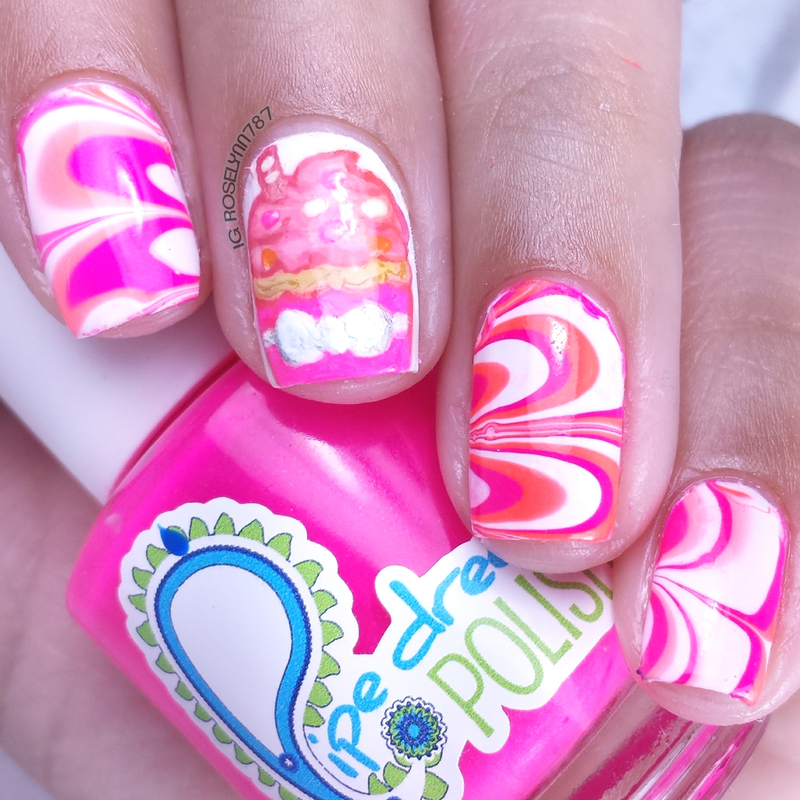 These bestie nails are so freakin' cute! I admire your determination with the watermarble, it looks lovely. Aww, that is so cute!! Happy Birthday Cheyenne!! These are fantastic!! You did a great job! Aw thanks a lot, I'm glad you like them. Great job, I love both Chey's and your mani! I can't imagine having the patience to get my nails to look like that--if I even could! They really look beautiful! Thank you! It definitely requires a lot of patience. These look so pretty, you did a great job. I really love the marbled effect and the little cupcake is so cute. I love Bestie/Twin nails! And those cupcakes are so cute! Those are so cute! I love the swirls, and the cupcake is the best. I love it! I can never get my marbles to look as pretty as this! Gosh you are so talented. The final look ended up really pretty! Those turned out so cute! I love the colors you used and the effect is great. So pretty! i love marbles! I love how your nails turned out! I have not tried this method before will have to give it a go. Oh my gosh! This is so pretty... I bite my nails so I couldnt achieve this! I'm glad you stuck with it too because they came out looking beautiful in the end. I usually just go and get mine done since I'm no good when it comes to doing my own mani/pedi. Your nails look so good! My nails never turn out that well. So colorful and I love the swirl designs. Perfect for spring! I love both your marbles so much! The colors are gorgeous. Wow, this looks stunning! I wish I could do something like this! Happy birthday to your friend, hope she had a great day. This is so adorable!! I love Cheyenne's version but yours is so cute too!!! Aww this is beautiful and colorful! I bet my friend who loves changing her nail polish daily would be fascinated with this one. 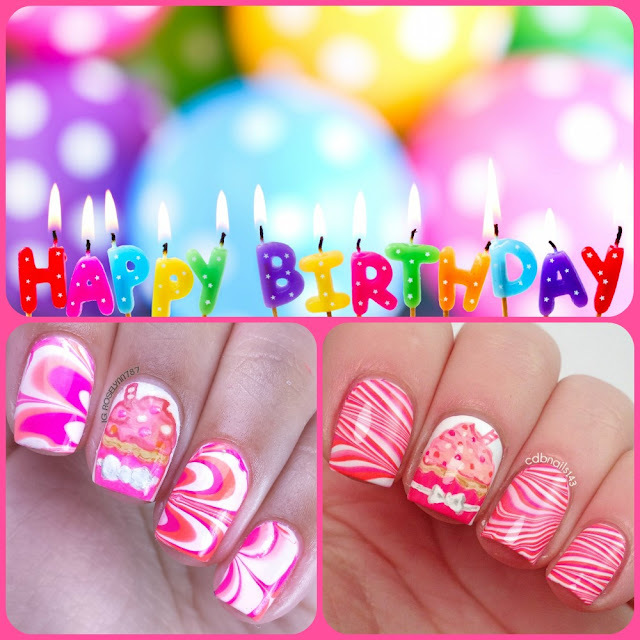 Now that are some cute nails!! Love the marble look. How fun! So cool. I am going to have to show my wife these nails. She loves to get all dolled up and I think she will get a real kick out of these patterns. They look great on you. Thanks for sharing. These look very nice! I like the coloring.